Introduction: Drought stress is one of the most important abiotic stresses that negatively influence crop performance and productivity. Plants acclimatize to drought stress conditions through altered molecular, biochemical and physiological responses. Gene and/or protein expression and regulation are thought to be modulated upon stress perception and signal transduction for providing requisite endurance to plants. Plant growth regulators or phytohormones are important molecules required for various biological processes in plants and are also central to stress signalling pathways. Among various phytohormones, Abscisic Acid (ABA) and Ethylene (ET) are considered to be the most vital growth regulators implicated in drought stress signalling and tolerance. Besides the above two known classical phytohormones, Salicylic Acid (SA) and Jasmonic Acid (JA) have also been found to potentially enhance abiotic stress tolerance particularly that of drought, salinity, and heat stress tolerance in plants. Apart from these several other growth regulators such as Cytokinins (CKs), Auxin (AUX), Gibberellic Acid (GA), Brassinosteroids (BRs) and Strigolactones (SLs) have also been reported to actively participate in abiotic stress responses and tolerance in plants. The abiotic stress signalling in plants regulated by these hormones further depends upon the nature, intensity, and duration of exposure to various environmental stresses. It has been reported that all these phytohormones are also involved in extensive crosstalk and signal transduction among themselves and/or with other factors. 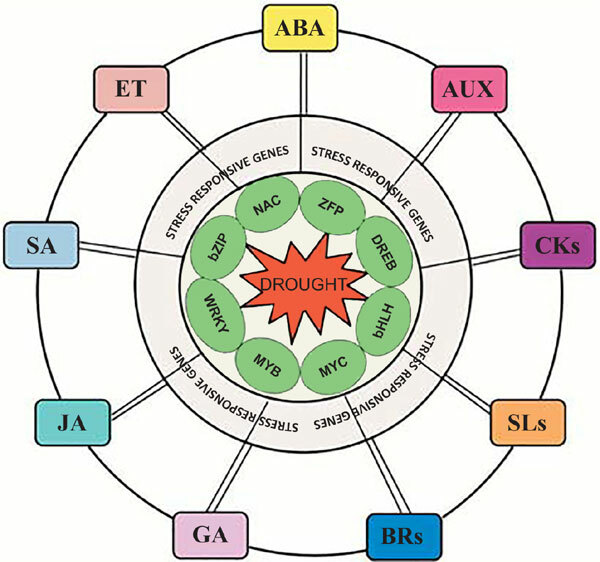 Conclusion: This review thus summarizes the molecular mechanism of drought signalling and its crosstalk with various phytohormone signalling pathways implicated in abiotic stress response and tolerance. Keywords: Abiotic stress, Crosstalk, Drought, Functional genomics, Phytohormones, Signal transduction. Keywords:Abiotic stress, Crosstalk, Drought, Functional genomics, Phytohormones, Signal transduction. Abstract:Introduction: Drought stress is one of the most important abiotic stresses that negatively influence crop performance and productivity. Plants acclimatize to drought stress conditions through altered molecular, biochemical and physiological responses. Gene and/or protein expression and regulation are thought to be modulated upon stress perception and signal transduction for providing requisite endurance to plants.